The most obvious reason is to protect yourself, family and possessions from harm or theft. According to FBI.gov violent crimes in 2016 have increased for the second straight year. The rise was 4.1 percent over the 2015 data. Residential burglary is one of the most prevalent crimes in the United States as well as in other Countries. Homes without a security system are more likely to be targeted by a burglar than homes with security. One of the features that can be integrated into security systems is fire protection. In addition to intrusion sensors, smoke detectors or rise of heat sensors can be added to the system that allow for monitored protection against fire. Whether you’re at home or not, a fire will be reported to a central monitoring station which will determine whether to dispatch local fire departments and or ambulances. Much like fire protection, Carbon Monoxide sensors can also be integrated with the system to detect dangerous levels of CO in any space of the home. With each year averaging 2.5 million burglaries across the United States peace of mind can go a long way. Whether you are home or not or maybe your kids are home by themselves, security can go a very long way in providing less worry and stress. Integrated security systems allow you more than just security by providing you with real time alerts through varies types of sensors in the house. Certain activity can trigger these alerts without triggering an alarm. These added features can be priceless in providing much needed peace of mind. Homeowners insurance companies will give you a discount on any security system that is monitored by a professional security company. Typically, the discount is anywhere from 10-20% depending on the insurance company you have. 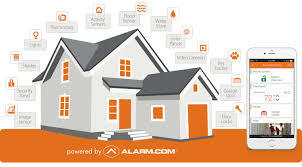 Security systems have evolved from just a system to protect your home by signaling an alarm when a sensor is tripped. Most security systems integrate with smart sensors that allow the homeowner more control and automation of their daily activities. Home owners can now control locks, lights, thermostats, outlets, garage doors, video devices such as cameras and smart doorbells. All of which is controlled through a single app. In addition, the homeowner can set rules for the daily functions of their lives. For example, users can setup a rule for when they disarm the alarm, locks unlock and the living room lights come on. Or say you want to know when the basement temperature drops below 40 degrees? That can be done as well. 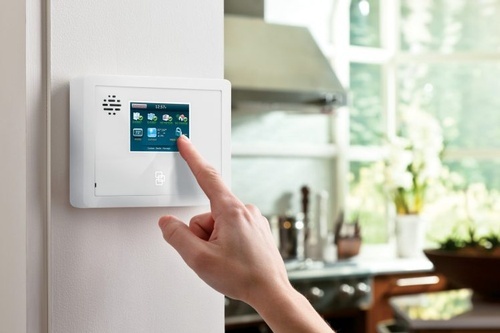 With the evolution of technology, it is getting easier and easier to utilize a lot of different smart devices with the security system making it an all-in-one solution. 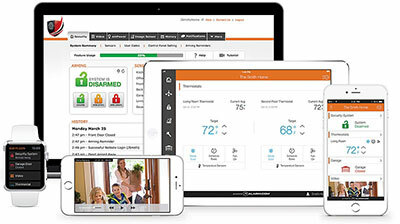 As noted in the Home Automation section, Video security is another feature that can be added to the system. Indoor or Outdoor cameras can be added to the system allowing the user to view live or saved motion detection video clips. Like most devices users can set rules for when the video is captured, and they can also setup push notifications to come right to their phone. Do you want to know every day when your kid gets home from school? This can be done with a simple rule. Other video devices are smart video doorbells. These devices allow users to speak directly to anyone who rings their doorbell whether they are home or not. In addition, the homeowner can record motion activity and talk to anyone at any time, even if they do not ring the doorbell. Another advantage of home security is the ability to report medical emergencies. Whether it be the push of the emergency button on the security panel or the use of a panic pendant, users can have emergency personal dispatched. This comes in handy for elderly individuals or individuals with a medical ailment that hinders them in some way. As stated before, Thermostats can be controlled through the security system. This can be done manually through the app or users can setup a rule. Rules are set by an action, such as when the panel is armed this action can be set to turn the thermostat down to 60 degrees. In addition, rules can be setup for turning off lights, turning off sprinklers, letting you know when windows are left open and even monitoring the power usage of a plugged-in appliance. This is a relatively new concept in the security space, but wellness is becoming a topic discussed alongside security. Sensors at this point are very limited but I see it becoming much like home automation was a couple years ago. Wellness right now is monitored through a bed sensor that will monitor your sleep much like Sleep IQ by Sleep Number. You can then get reports of your sleep cycles and when you were restless through the night.